Model: DODGE STRATUS. This item is from a 2002 DODGE STRATUS. Axle seals, front seals, and drive shaft seals will also need to be replaced. Transfer cases will not be included with transmissions from 4x4 or All Wheel Drive vehicles. Free Shipping! No Core Charge! 60 Day Warranty! LKQ SKU: LKQ131 ~211787287 TRA03957. This is NOT a manufacturer part number, and can be disregarded. We do our best to prevent these issues from happening and apologize for any inconvenience it may cause. SEBRIN 01 AT, Conv. SEBRIN 02 AT, Conv, 2.7L. SEBRIN 01-02 AT, Sdn, 2.7L. 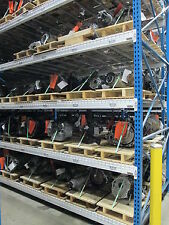 Axle seals, front seals, and drive shaft seals will also need to be replaced. Transfer cases will not be included with transmissions from 4x4 or All Wheel Drive vehicles. 90 days money back or item exchange. The information about the donor vehicle, mileage, and warranty is found below. SEBRING 2002 -2005 AT; Cpe, 2.4L. STRATUS 2002 -2005 AT; Cpe, 2.4L. GALANT 2002 -2003 AT; 2.4L (4 cylinder). LKQ SKU: LKQ112 ~182584949 TRA61305. This is NOT a manufacturer part number, and can be disregarded. We do our best to prevent these issues from happening and apologize for any inconvenience it may cause. Mopar Performance 4659676AC MOPAR SensorMOPAR 4659676AC Sensor. Public Forums. Need to make a change?. Disclosure of Information Policy. Your credit card information is encrypted while traveling the Internet. MT=Manual, AT= Auto, CVT=Continuously Variable Transmission. SEBRING 2002 -2002 AT; Conv, 2.7L. SEBRING 2001 -2001 AT; Conv. SEBRING 2001 -2002 AT; Sdn, 2.7L. Warranty does not cover labor. STRATUS 2001 -2002 AT; Sdn, 2.7L. Condition: 98k. MITSUBISHI GALANT 02-03 AT, 2.4L (4 cylinder). Transmission Assy. A = Less than or equal to 60k miles, or greater than 60k miles but less than or equal to 200k miles and less than or equal to 15k miles per year. MT=Manual, AT= Auto, CVT=Continuously Variable Transmission. STRATUS 2002 -2002 AT; Sdn, 2.4L. Warranty does not cover labor. SPECIFIC PART NOTES : AT,2.4L,04\02, W/ HARNESS. SEBRING 2002 -2002 AT; Sdn, 2.4L. The information about the donor vehicle, mileage, and warranty is found below. PT CRUISER 2002 -2002 AT. Model:PT CRUISER 2002. SEBRING 2002 -2002 AT; Conv, 2.4L. SEBRING 2002 -2002 AT; Sdn, 2.4L. STRATUS 2002 -2002 AT; Sdn, 2.4L. LKQ SKU: LKQ112 ~206595085 TRA61305. This is NOT a manufacturer part number, and can be disregarded. We do our best to prevent these issues from happening and apologize for any inconvenience it may cause. FREE 90 Day Warranty Included! 108,942 Miles! Message us for fitment confirmation! The information about the donor vehicle, mileage, and warranty is found below. GALANT 2002 -2003 A.T.; 2.4L (4 cyl). Model:GALANT 2002. Year: 2002. SEBRING 2002 -2005 A.T.; Cpe, 4-2.4L. LKQ SKU: LKQ830 ~164995996 TRA61305. This is NOT a manufacturer part number, and can be disregarded. We do our best to prevent these issues from happening and apologize for any inconvenience it may cause.